I wish I had a tiny waist. 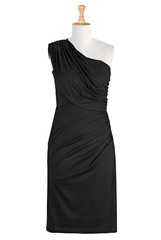 I wish I could wear any type of dress and look great. Unfortunately, after 3 pregnancies, my stomach remains stretched out and much too large. 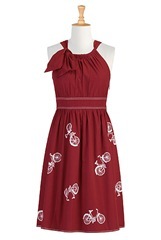 It is really hard to find clothes, especially dresses, that fit me and don’t make me look pregnant. 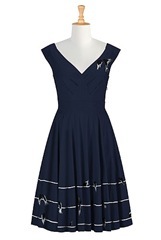 So when I was contacted by eshakti.com, I was really excited to try out their custom sizing option and hopefully find a dress that fit me perfectly. eShakti is a fresh concept in custom clothing. We believe that all women have the right to wear affordable fashion. What began as a small website offering basic cottons and modestly embellished pieces has grown into an international company offering fashionable custom clothing. 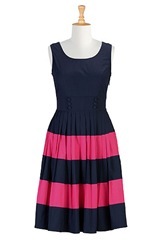 eShakti offers both design and fit customization for women size 0 through 36. This is the heart of our business. Our custom capabilities allow customers to easily tailor any item to their specific requirements ensuring a flattering fit. Built-in customization tools guide women through our simple 3-step design and fit page where they can increase the size of a bust, shorten the length of a skirt and modify sleeves or a neckline! We believe that custom clothing does not have to be expensive. By keeping up with technology as it is advancing, we are able to provide customization at a modest cost and offer it to all women. We do not stock any sizes. Since each style–whether standard sized, custom styled or custom sized–is cut to order, we do not have to warehouse our merchandise. Therefore, every style requires a height measurement–whether customizing or not. This ensures a “truer” fit. We ship directly to our customers in about 2 weeks from the date of order. We ship across the USA and Canada. eShakti first contacted me on December 12, 2012. I immediately replied stating I was interested in reviewing their product. Five days later on December 17, I received the information on how to order. I submitted my order that same day. 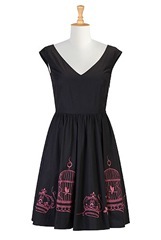 I chose this dress. I used the custom measurements due to my not quite normal body size. 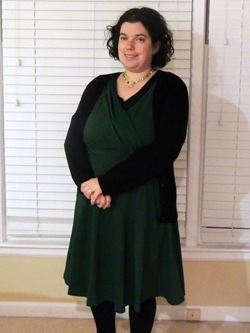 I also requested longer length sleeves, as I wanted the option to wear the dress without a shirt under it if I wore the dress to synagogue. (as it turns out, I still need a shirt under it to cover the low cut neck, but I could use a short sleeved shirt for this). My dress shipped on December 21 and I received shipping confirmation on December 28 – after I had already received the dress. On December 30, I put on the dress and discovered that it had a small tear in one of the seams on the waist. I emailed the company that evening asking if I should review the dress as it was, or if they would send a replacement product. I emailed them again on January 4, as I had never received an answer. On January 5, they replied saying they missed my previous email and would look into whether they could replace the dress. 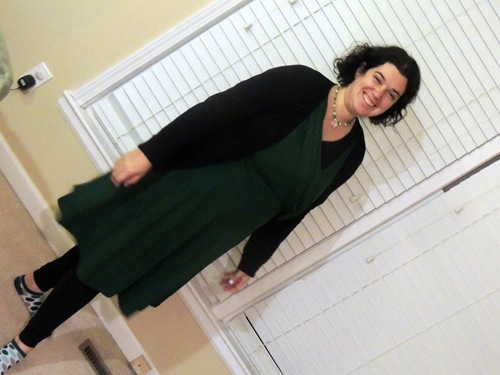 Meanwhile, I decided to wear the dress anyway, with a cardigan over it to cover the tear. The dress fits. Does it look like the picture? No. Does it look good on me? Well, I got plenty of compliments wearing it. 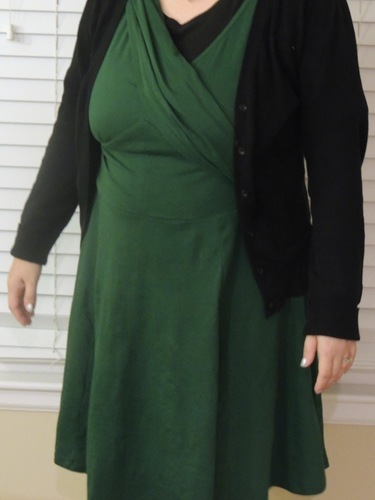 The material in the middle, the reason I loved the dress in the picture, is too loose. It doesn’t fall correctly across my chest. I imagine this is due to my size issues. 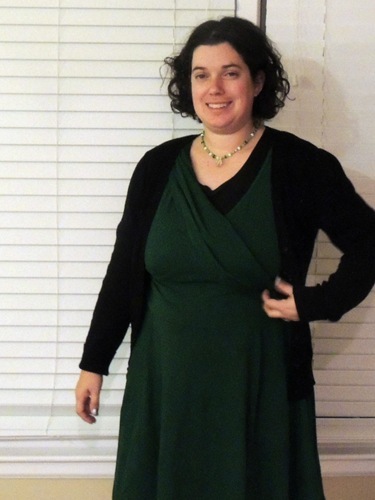 On January 10, I emailed eShakti again asking whether they were able to find out about a replacement or if I should go ahead with the dress review. 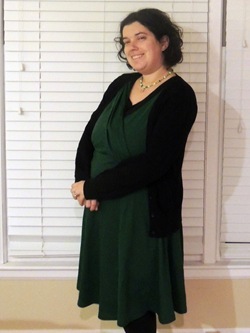 After not hearing back for almost a week, I decided to go ahead and review the dress I had originally received. Then, yesterday morning I received a reply stating that the material was not available and that I should choose another product to review. 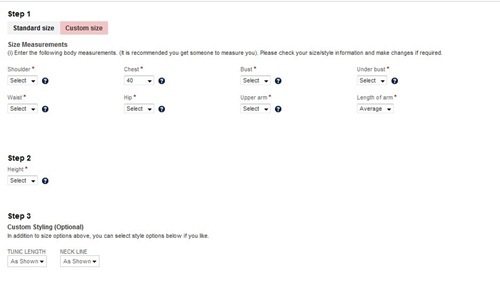 However, as I tried to fill out the custom size order, the site would not register my selection for the width of my shoulders. I tried multiple times, even trying a different dress (the one on the right), but it would not work. 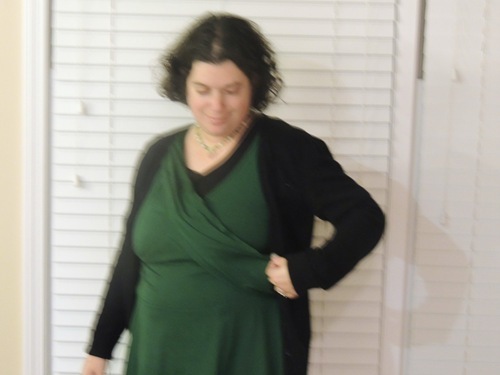 I was scared to order a standard size because the waist will likely be much too small. 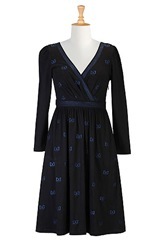 So I sent out yet another email to eShakti. This time they replied about 12 hours later and told me to send them my info directly. 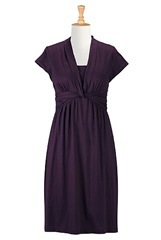 I went with the purple dress above and sent in my info last night. Looks like there will be a part 2 to this review. 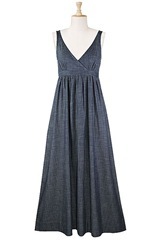 When I get my waistline back I will happily order one of these dresses! 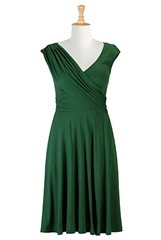 What do you think of the green dress I chose originally? How about the purple one? When confronted with the hole in the dress, would you have contacted the company for a replacement?